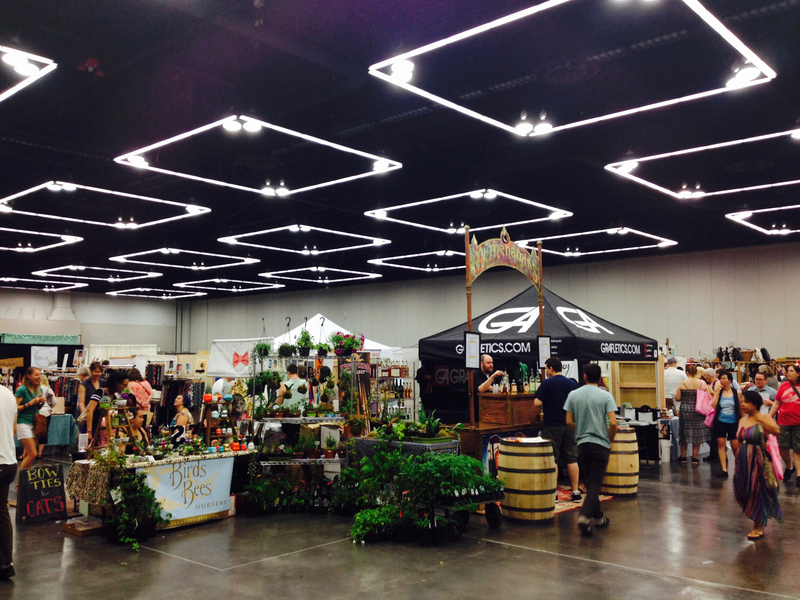 Yesterday, I took a business trip of sorts to Crafty Wonderland’s Spring Market in Portland at the Oregon Convention Center. 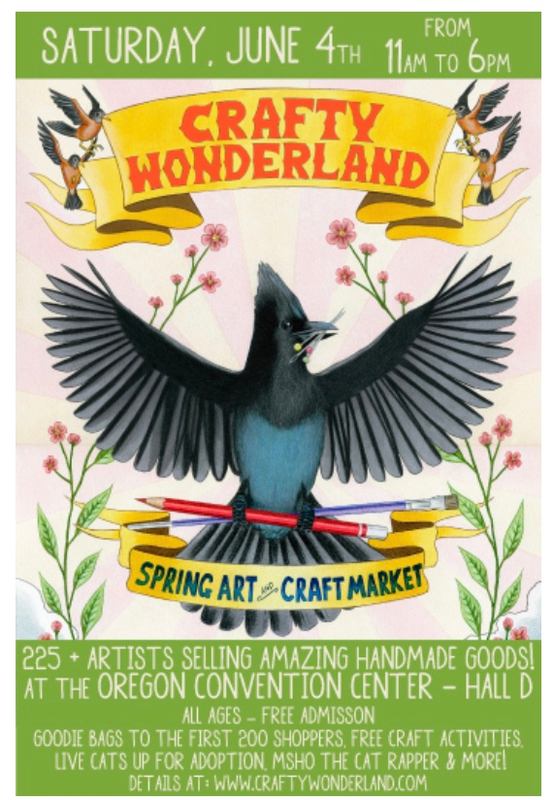 I have a dream to have my coloring books and/or future products in the Crafty wonderland shop or at one of the craft fairs and I wanted to see just how possible it would be to conceptualize a booth for Oscar Astoria someday. As I walked in Modest Mouse was playing. I looked down at my arms; the goosebumps started. Was it the hip bohemian jewelry, bow ties for cats, hand knitted everything, air plants, zines, stuffed toys in the shape of sushi and MSHO The Cat Rapper that was making me cringe, or turning me on? 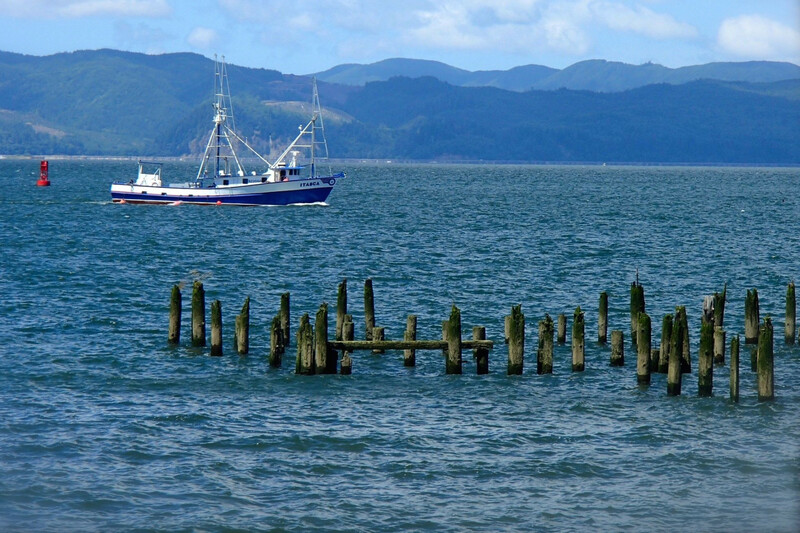 Could I really handle ‘the Portland’ of it all? The answer is yes, yes, YES! ….I think? My pocketbook told the story when I left the craft fair of how much I enjoyed myself. The honest to goodness truth is that I was meant to be there. 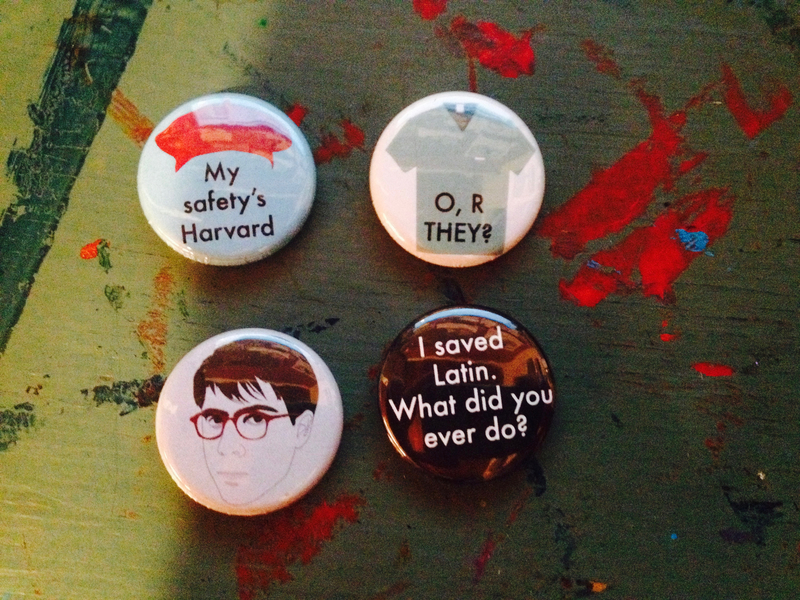 I mean, I wore my special Rushmore buttons. The big surprise, more than no one commenting on my buttons from Etsy (sorry, Max maybe they were jealous that they never saved Latin), was that the exact things I came into the Market to buy were not the things I walked out with in the end. Big surprise, I ended up gravitating towards the zine booth: Know Your City (dot) org. 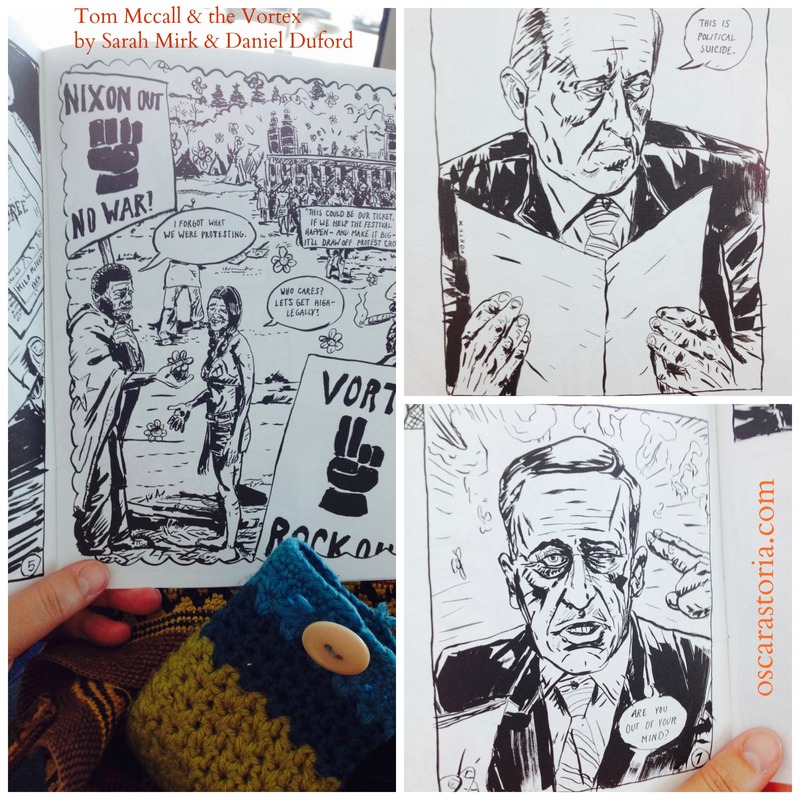 Lots of cool stuff, but I settled on a Zine: Tom McCall & The Vortex, sparked by one of Matt Love’s recent presentations on the festival at The Lovell Room at the Fort George. The illustrations and the writing is stunning; love this zine. The expressions are amazing and I really love the medium used. Very graphic and eye catching and a super fun read about our Oregon history. Tillikum Bridge hoodie (super soft–from Alshiref Design & Prints) (he offers plus sizes and was very sweet, he said: “this will be your new favorite hoodie!”) I thanked him for carrying plus size, as sometimes I honestly just stop asking if anyone has extended sizes. Believe it or not, besides spending way too much money, I learned some stuff. The one thing I had my eye on before I even entered the market really lost its appeal after it seemed that the vendor selling it really didn’t have time for me or to answer my questions. However, I want to make it very clear that I’m NOT throwing shade; people can do whatever they want (of course) and I get it: creatives are introverts and and dare I say moody and complicated at times? Yet, I just have a really hard time cracking open my wallet to access my precious money (that takes me a long time to save up because I make so dang little per hour) and buy something from someone who is more interested in texting than talking to a potential customer. It was interesting to see the different vendors—some smiling making eye contact inviting you to stop for a bit while some were sitting tattooed arms crossed avoiding eye contact, texting madly. It makes me clap my wallet shut faster than a speeding ticket. Instead of feeling intimidated, I felt encouraged that I might have a super power! I honestly love all parts of the process, from creating my art to selling it. 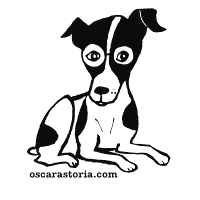 And although I’m a neurotic nerdy introvert, I LOVE selling my own products. While many relish in the creating stages and find promotion and selling tiresome, I don’t think I will ever get enough of people fawning over my coloring books (a few have and a few not so much), asking me about the process, asking for advice on whom to give my book to as a gift. I want to be the inviting, gracious, appreciative vendor and artist. Money is time, energy, blood sweat and tears. I want to honor that. What it made me realize is that I’m probably not alone in the sense that I want a personal connection with the artist/crafter. Even if it’s a quick smile, a kind word, it means a lot. Many of the vendors I have been following for years; I am a fan and these are my heroes–people who are living their authentic life making a living off of their creativity. Maybe they are so dang popular that they don’t need to hustle anymore; maybe a certain number of sales are just a given. Yet, when I had my book launch, I noticed that the most important part of promoting and selling your goods is a connection with the product or the seller; and, I firmly believe (as a follower and fan of handmade goods for over a decade) that customers expect that connection with the maker. They long for it, as I long for a connection with the item that I buy and ultimately plan to wear and love. I mean, it’s SUCH an honor to have people buy what you’ve made, let alone be even remotely interested in it. I vowed yesterday to greet every one of my customers with eye contact and a smile and never let myself become cynical or take for granted any single sale I make on anything I make. I also vowed to offer extended sizes (from xtra small to plus size) for my customers or don’t offer the product at all. When I got back to Astoria, I had one more treat waiting for me. 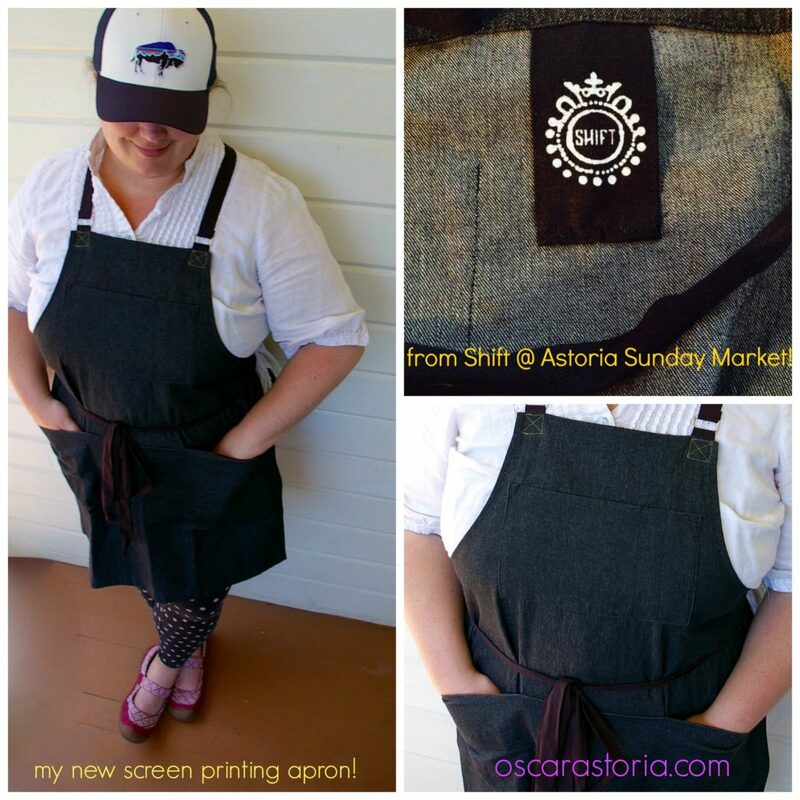 My new apron from Becky at Shift was waiting to be picked up from the Astoria Sunday Market. It will be my new screen printing apron (once I get that going). I am already loving it, as it’s nice and long, super adjustable and she added nice long straps so I can bring the string around and tie it in the front. 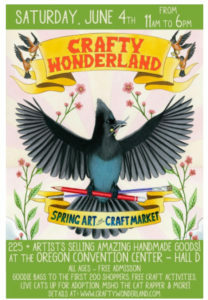 Things are moving along slowly but surely with my small business and the Crafty Wonderland Spring Market was really inspiring!